Was it the late emergence of the platform or the different design of the interface that killed this promising operating system? Let's take a look. If you look at any of the smartphones currently available in the market, you'll see that they have a user interface that's pretty much a copy of Microsoft's "desktop" - they have a menu that offers access to all apps installed on the device, from Swedish casino games to calendars, dialers, games and such, and a home screen that has only a few selected app shortcuts and widgets on them - the ones the user accesses the most. With Windows Phone, in turn, Microsoft turned away from its classic desktop configuration, turning its mobile user interface into a series of tiles that served not only as shortcuts for various apps but also as widgets, actively displaying various pieces of information, depending on their size. This seems to have been far too different from what Microsoft made its desktop users familiar with - anyone you hear talking about Windows Phone speaks of an interface that's too unfamiliar to work with. Those, in turn, that have used a Windows Phone device as their first smartphone will praise it for its logical arrangement, usefulness, and fluidity. Back when the iPhone first arrived, it had little to no functions of its own - everything was done through third-party apps that users could download and install on their devices. Today, smartphone apps are perhaps the most lucrative branches of the mobile industry, especially when it comes to mobile games that are expected to generate more than $70 billion in revenues this year. Microsoft has apparently failed to attract large masses of app developers to its own platform - perhaps because its two competitors were already pretty widespread and offered better chances of monetization. Thus, the number of apps available for Windows Phone was minuscule compared to its competitors, making it very much unpopular among users. The situation remained the same even after Microsoft rolled out its "Universal Apps" concept with the release of Windows 10 on both desktop and mobile devices. Ultimately, Microsoft's mobile operating system has become "irrelevant" in the mobile OS market, leading to the company suspending the active development of Windows phones in October 2017. 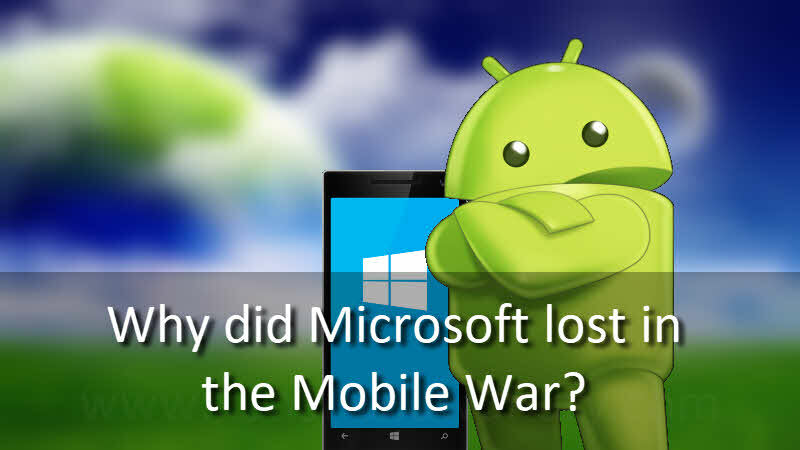 If you have come this far, it means that you liked what you are reading (Why did Microsoft lost in the Mobile War? ).